UHD upgrade with SUP 2.0 software enabling UHD 3840 x 2160 ProRes 4444 at 60 fps. Viewfinder and audio board upgraded. 14 stops of latitude enabling huge dynamic range. 0.75 - 200 frames/sec at 4:2:2. Adaptor for 2/3"(B4) lens is available. 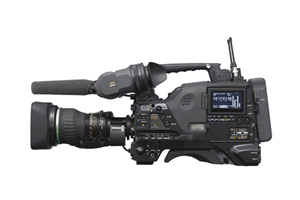 The PMW-F55 CineAlta camera shoots in HD, 2K or 4K onto SxS or external AXS-R5 recorder. There is also high speed shooting up to 240 fps RAW 2K and 60 fps in RAW 4K recording onto the AXS-R5. PL mount and new Sony OLED viewfinder allow easy use and spectacular results. Shoot HD or 4K on-board with CFast dual card slots. 15 stops of latitude with Canon Log2. High sensitivity enabling low light shooting with lower noise. Multi format camcorder featuring optical disc recording with facility for under and over cranking. 50Mb/s compression with 4:2:2 recording makes this camera ideal for a wide variety of mid to high end applications. Full frame 35mm sensor with ultra high sensitivity up to ISO409600. Extreme low light capability. Camera kit includes Movcam rig, audio pod, Metabones EF lens adaptor, 2 x 64Gb SD cards. 16Mp micro four thirds camera with unlimited 4K on-board video recording. Camera kit includes Metabones EF lens adaptor, 2 x 64Gb SD cards.